Christmas Day in a Buddhist household be a rather anti-climactic affair so rather than stay in all day reading or watching TV, and considering that I'd already done the Kosin University Christmas Tree Festival two years ago, I planned to go to the Nampodong district, where we could have a quick look around the new Lotte Department Store before finding somewhere nice to eat in the shopping district. 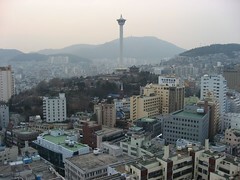 But leaving Korean Mother at home on her own on Christmas Day was deemed to be to awkward, even if she was a Buddhist, so she was invited along, and it became a fully-fledged shopping trip. I had been taken aback at just how busy Nampodong had been when I was last there on the 20th, considering how cold it was, but even that didn't prepare me for the 25th. The first indication was the subway trains, which were much more crammed than usual, as were the underground shopping areas which are sometimes so large it's possible to walk from one station to the next without going up to the surface. Ominously, we started hitting advertising for the new Lotte store well before we reached it, even if the blanket coverage on the local news channels meant it hardly needed any introduction. 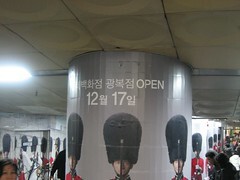 Oddly, pictures of the Queen's Guard were being used to promote the store. I didn't get the link. 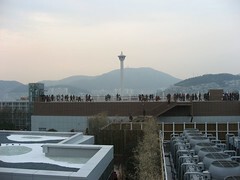 The Department Store is only one part of a Lotte World-type complex which is still under construction. Soon, a Lotte Cinema will follow, and possibly on the principle that there's nothing like guaranteeing an audience, a high-rise apartment block will be built behind it. 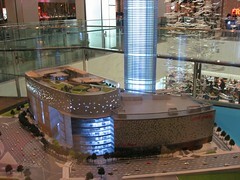 It's unclear how tall this will be, but from the model it looks like at least 60 floors. Inside was a vision from hell. 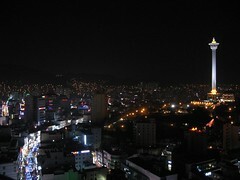 Korean hell. 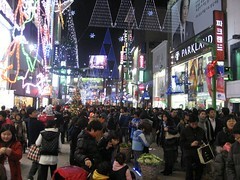 Korean shopping hell - which as most foreigners here know, is a very special kind of hell. There was hardly any space to move. It was so bad, not only were there queues for the escalators, there were staff stationed at them to regulate the number of people getting on. 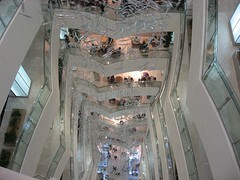 Warnings about escalator safety played constantly over the store's PA system. Despite which, there was still nearly a nasty crush at the top of one we were on, as people almost fell over each other adjusting from a moving to a static floor. Later, a snaking pathway was set up with mobile barriers to separate the adjacent top of one escalator with the bottom of the next, to keep people apart. If you could hear the festive music playing over the wall of noise that was a thousand simultaneous Korean conversations, it was Jona Lewie's Stop The Cavalry. And can you stop the cavalry? Of course not. Dante's Inferno has nine circles of hell, but the Lotte Department Store actually has ten floors - eleven if you count the rooftop - and another three underground. 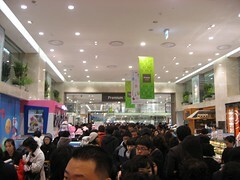 As we worked up through Lotte's circles of hell, the crowds at least did thin out. Band Aid's Do They Know It's Christmas? now played over speakers imploring people to Feed the world, Feed the World as they browsed through the large number of high priced designer stores. And who knows how many people are starving just a few hundred miles from here? What could be more deliciously ironic than putting a Zen garden on top of all this chaos? 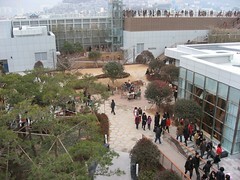 And they did, as part of a larger garden area which is fortunately surrounded on all sides making it somewhat protected from the elements of a cold Korean winter. The rooftop work isn't finished though - it's still under construction. 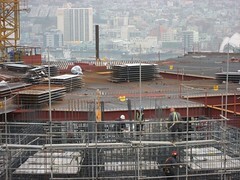 In fact, construction workers could be seen amidst the scaffolding at what will eventually be a larger garden area. Christmas Day is a public holiday in Korea, and while it's a reality that shop and restaurant workers are going to be forced to do their jobs, it's more surprising that construction workers are pressing ahead with their tasks today. 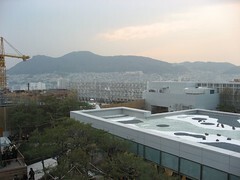 The rooftop has two 'Observation Decks' at opposite ends of the building - the 'Sea View' and the 'City View', which afford good views of the city and the docks. 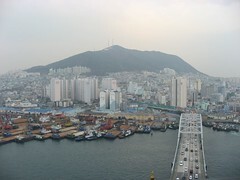 No doubt it looks better on a clear day, but there aren't too many of those in Busan - and Christmas Day was no different, suffering from typically Korean atmospherics. We worked our way back down through the circles of hell to the lowest floors where expensive clothing and even more expensive jewellery gives way to food - and lots of it. Certainly, there are no dangers of a famine here. My wife and Mother-in-law want to eat Korean food - I don't - so I have my eye on some nice looking Turkish food but then get lost in the river of souls pushing me on towards some uncertain fate, and I can't find the place again - more importantly, I lose the will to try. I end up getting a Mexican tortilla, which I ate in a chaotic area reminiscent of a school cafeteria - but much noisier. Christmas Lunch, 2009. By the time Korean Mother and Wife joined me, I'd finished and spent most of the rest of the time writing this blog entry on my phone-with-a-keyboard. 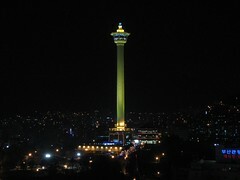 An announcement was made that the opening hours of the store would be extended by one hour, until 9pm. It wasn't clear if that meant staff would be getting an extra hour's wages, but I suspected not. The slow progress of the war in the lower floors and our constant marching to and from the enemy meant that by the time we escaped from the Food Area Limbo it was dark outside, so I summoned the strength to fight my way back up the building to take some night-time shots of the views from the Observation Decks. With every other 18-year-old girl apparently walking round with a DSLR these days, it hardly seems worth the effort, but I press on regardless with my hacked digital compact. As well as watching Busan Tower change colour against the city backdrop, I could also see the Christmas Tree Festival snaking along Nampodong's main shopping street. One might assume that the Lotte Department Store had sucked in all the souls that would otherwise we wandering the streets nearby, but this proved to be wrong. 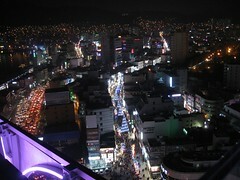 Retailers on the local TV news had claimed that since the Store opened on the 17th, business had increased by 30-40%. But Nampodong's main street probably had 300% of the normal number of people on it - with so many people, everyone's pace was slowed to an uncomfortable crawl. People bravely still tried to take photographs of the Christmas lights, but they were also fighting losing battles. I'd been here briefly on Christmas Day two years ago, but this seemed much worse. It took us a long time to reach the main square, and it seemed appropriate enough that there should be people there offering "Free Hugs" - God knows, I felt I needed one by this time. 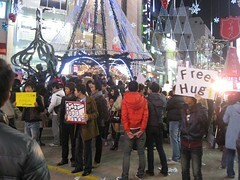 I was impressed that the Free Hugs Campaign had made it here, and that it was still going a number of years since its inception. I was slightly less impressed at the suggestion from the small print on the placards that it seemed to be a corporate ploy by LG Telecom. 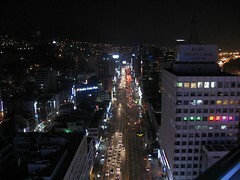 I suppose this is Korea, after all. 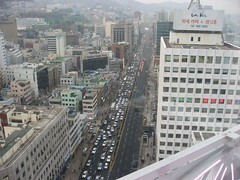 Number of Koreans seen today - ~30,000. Number of foreigners knowingly seen - 15. 2 Russians, 2 Chinese, 7 Westerners, and 3 Southeast Asians. Even by the standards of Busan, it was a very poor turnout by the foreign contingent - I assume they sensibly stayed away from Christmas Day shopping. Wow. That sounds a little... crazy. Actually, a LOT crazy. I don't think I could be sane amidst that many clamouring people. 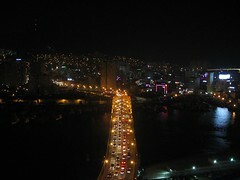 Note to self: refrain from shopping in Busan on Dec 25th. Check. It is really interesting that they use the Queen's Guard and "Stop the Cavalry" to advertise though. Perhaps they think it makes it more... regal or something... lol. Anyway, thanks for sharing, I always love seeing the pictures!! 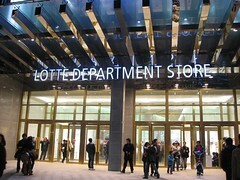 "Dante's Inferno has nine circles of hell, but the Lotte Department Store actually has ten floors"